Let’s give a big round of applause to the « Blu » for receiving the chic and prestigious Hotel Property Award 2013. This prize was simply very well deserved. The Radisson Blu's transformation of the former Palais de Justice, an austere government courthouse, into a luxurious hotel is nothing short of miraculous. From the imposing lobby cheerfully decorated with bright red and fuchsia couches to the former courtroom exquisitely transformed into a stylish restaurant with low hanging lights, Stéphane and I marveled at how skillfully the designers had merged the old with the new. It's exactly what we hoped to do as we bid 2013 farewell and welcomed 2014. Fortunately, the thoughtful details extended to the guest rooms because the pouring rain and holiday closures didn't give us much incentive to leave the hotel. While watching back-to-back episodes of "The Good Wife", an American television series about a woman lawyer that paired nicely with our accommodations, Stéphane and I were thankful for the comfortable bed and handy Nespresso machine in the room. When we finally emerged from our cocoon, the hotel's receptionists graciously helped us finalize our sightseeing plans by calling to confirm the schedule of the shuttle boat to Trentemoult, a colorful fishing village, and printing information about other noteworthy sights in Nantes. La Cigalle in Nantes, France. Stephane's father has an uncanny memory for restaurants. When we called to wish him a happy new year and mentioned that we were in Nantes, Werner immediately suggested that we go to La Cigale. Opened on April 1, 1895 and classified as an historic monument in 1964, La Cigale is ornately decorated with tile frescoes on the walls, carved wooden reliefs above the doors and painted wooden beams on the ceiling. A large wooden cicada, the restaurant's mascot, gazes down on diners enjoying towering platters of fresh seafood and hearty bread slathered with hand pressed Brittany butter. 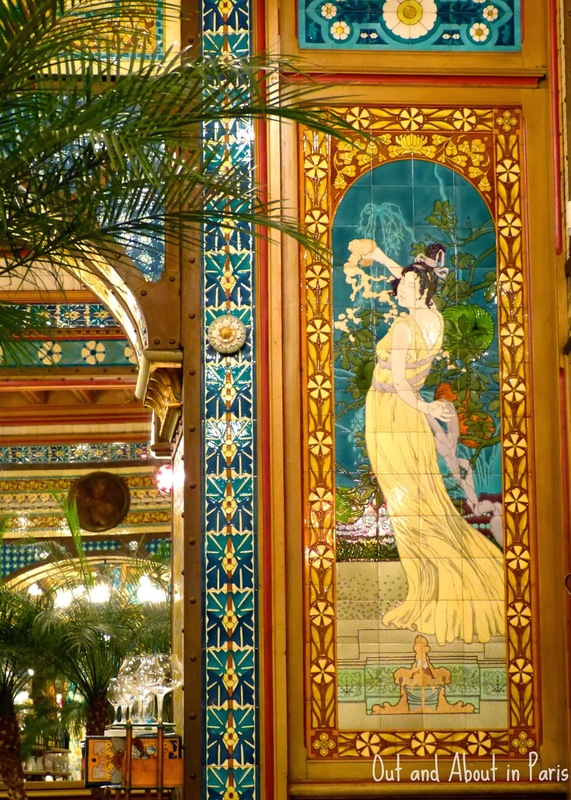 While memories of my crab and avocado starter, savory scallops and decadent profiterole and ice cream dessert will eventually fade with time, I'll long recall the amazing Belle Époque decor of this traditional French brasserie. Click here to see an album with more photos of Nantes. Next post: Things to see in Nantes. 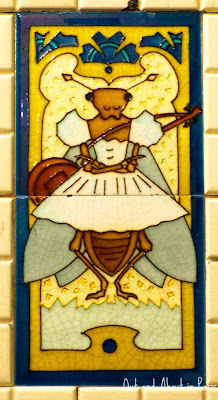 Tile frescoes in La Cigale in Nantes. You would really like La Cigale, Carolyn! 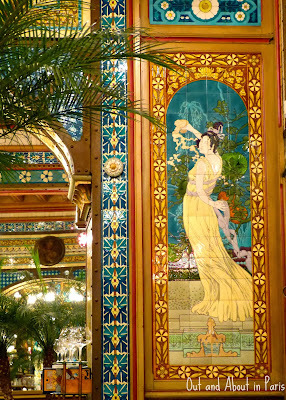 Stéphane and I spent most of the meal admiring the decorative tiles. The colors are amazing! We just finished season 1 of the Good Wife and have ordered season 2 from Amazon.uk. While we're waiting for it to arrive, we're going to start watching season 4 of Downton Abby! There may not be any more blog posts for the foreseeable future! ;) I hope that you're keeping warm in Boston. I love the Cigale but have only been there for breakfast - and what a breakfast! My in-laws lived just outside Nantes and when we visited we stayed at a little hotel called "Le Hotel" and have breakfast at La Cigale. No one ever understood why we weren't hungry at lunchtime. Of course, the décor is wonderful as well. After reading your helpful comment on FB (thank you! ), we were planning to go to La Cigale for afternoon tea since a breakfast buffet was included in the price of our room at the Radisson Blu. Have you been to the History Museum at the Palais des Ducs de Bourgogne in Nantes? It's really well done. I think that it only recently reopened after being closed for 20 years.